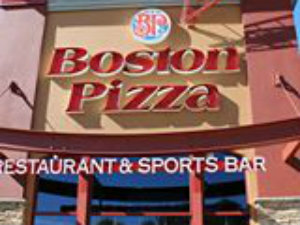 Boston Pizza has over 100 items on our Menu, Steaks, Ribs, Salads, Pizza and Pasta!! Great Sports Bar with New Hi Definition TVS!! Relax on the Patio! Dine In, Take Out and Delivery!! *Leafs TV, Centre Ice Package and UFC! *Great Place for Teams! "Team Kickback" rewards our loyal teams with a party at the end of their season and lots more! Sign Up in our Sports Bar! Please contact Barb Brazeau @ barb.brazeau@sympatico.ca for more information.